Formation and dissociation of the interstrand i-motifs by DNA with the sequence d(XnC4Ym) (X and Y represent thymine, adenine, or guanine, and n, m range from 0 to 2) are studied with electrospray ionization mass spectrometry (ESI-MS), circular dichroism (CD), and UV spectrophotometry. The ion complexes detected in the gas phase and the melting temperatures (Tm) obtained in solution show that a non-C base residue located at 5′ end favors formation of the four-stranded structures, with T > A > G for imparting stability. Comparatively, no rule is found when a non-C base is located at the 3′ end. Detection of penta- and hexa-stranded ions indicates the formation of i-motifs with more than four strands. In addition, the i-motifs seen in our mass spectra are accompanied by single-, double-, and triple-stranded ions, and the trimeric ions were always less abundant during annealing and heat-induced dissociation process of the DNA strands in solution (pH = 4.5). This provides a direct evidence of a strand-by-strand formation and dissociation pathway of the interstrand i-motif and formation of the triple strands is the rate-limiting step. In contrast, the trimeric ions are abundant when the tetramolecular ions are subjected to collision-induced dissociation (CID) in the gas phase, suggesting different dissociation behaviors of the interstrand i-motif in the gas phase and in solution. Furthermore, hysteretic UV absorption melting and cooling curves reveal an irreversible dissociation and association kinetic process of the interstrand i-motif in solution. The online version of this article (doi: 10.1007/s13361-015-1093-2) contains supplementary material, which is available to authorized users. Gn and Cn repetitive sequences occur in chromosomes more frequently than expected for random distribution, and many of these are conserved in evolution . These sequences may form four-stranded DNA structures featuring G-quadruplexes [2, 3, 4, 5, 6] and i-motifs [7, 8, 9]. When predicting the likelihood of a duplex DNA with runs of Gs and Cs forming an alternative structure in vivo, the energetics and kinetics of the folding of both the G-rich and the C-rich strand must be understood. The i-motif is built by stacking hemiprotonated C•C+ base pairs (Scheme 1a, top). Two parallel ladders of C•C+ base pairs are interdigitated within one another, such that the two ladders are antiparallel and a C•C+ base pair from one ladder intercalates between two adjacent C•C+ base pairs in the other ladder (Scheme 1b, c). The nucleosides are anti, and paired nucleosides have glycosidic bonds in trans [9, 10, 11, 12]. C•C+ base pairs form a rectangle with the glycosidic bonds on diagonal corners. Adjacent intercalated pairs have the backbones at opposite diagonals (Scheme 1a, bottom). These structures can be formed from intramolecular folding or from the association of multiple oligonucleotides. The role of i-motifs in biology had been undervalued, because of the requirement for an acidic pH to stabilize C•C+ base pairs. However, it is now known that certain i-motifs may be stable in vivo [14, 15]. There are two kinds of i-motif structures, 5′E and 3′E, determined by the end of the intercalated base pairs at the outside of the structure (Scheme 1b) [12, 16, 17]. In a variant of the i-motif, the hemiprotonated pairs are not fully interlocking, leaving terminal Cs from one parallel ladder without intercalation partners and possibly unpaired (Scheme 1c) [18, 19]. The arrangement of intercalated C•C+ base pairs brings sugars and phosphate groups of two anti-parallel strands in unusually close proximity in the narrow groove, leading to a suitable distance for a C–H1'···O4' hydrogen bond between sugar pairs across this groove, and also enhancing electrostatic repulsion between phosphate groups [12, 20]. Factors that affect the formation and stabilities of the i-motif structure have been studied. For example, Krishnan et al. have created a hybrid i-motif composed of PNA and DNA that showed enhanced thermal stability . Non-cytosine nucleotides present in C-rich sequences can also affect the formation and stability of the i-motif structure through base interaction or stacking. For example, thymines in the sequences d(CCCT) , d(5mCCTCTCTCC) , d(5mCCTCnTCC) (n = 1, 2, 3)  and d(5mCCTCC)  formed T•T base pairs in an i-motif pattern. Similarly, A•A base pairs were found in [d(CCCAAT)]4 and the 5′E topology structure of [d(AACCCC)]4 [26, 27]. All of these non-C•C+ base pairs add to the stability of structures. Other contexts of the i-motif core such as d(ACCCT)  and d(TAACCC)  provide additional structural evidence that non-C•C+ bases at either end of the motif play an important role in stabilizing these novel DNA secondary structures. Most studies on i-motifs show that temperature, pH, and the length of C-tracts affected the lifetime and stability of the tetrameric i-motif [8, 11]. This is consistent with our previous observations [30, 31]. Leroy  also measured the formation and dissociation rates of three (TCn)4 tetramers (n = 3, 4, and 5) with NMR and proposed the strand-by-strand formation pathway of the tetramolecular i-motifs. Note that under these conditions, formation rates are measured in hours or days. So far, most i-motif structures have been determined by NMR and X-ray diffraction [10, 11, 12, 25, 28, 32]. 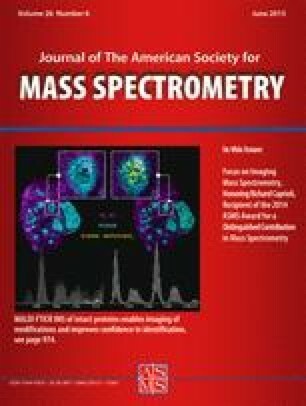 It has been demonstrated that electrospray ionization mass spectrometry (ESI-MS) is well suited for stoichiometric determination of noncovalent interacting oligonucleotides, including DNA duplexes, triplexes, and G-quadruplexes [33, 34, 35]. We previously used ESI-MS to show that d(G3T4G3) and d(G4T4G3) form bimolecular quadruplexes in solution, that these gas-phase complexes associated with the same number of NH4 + ions as had been seen in solution by NMR, and that high salt induced these bimolecular structures to form higher order complexes . Recently, the i-motif has also been studied by ESI-MS, Rosu et al. detected an IR absorbance signature indicative of a C•C+ base pair in gas-phase i-motif ions. All of these observations indicate that the interactions stabilizing multi-stranded motifs in solution remain in the gas phase during the ESI process. In this work, the interstrand i-motifs formed by a series of sequences, d(XnC4Ym) (X, Y = thymine, adenine, or guanine, and n, m are 0, 1, or 2) are studied with ESI-Q-TOF mass spectrometry. ESI-MS revealed not only 3′E and 5′E i-motif forms, but also various partially intercalated structures. The effect of the residue identity and n and m values on the formation and stability of interstrand complexes in the gas phase was detected and differentiated. The dissociation of gas-phase ions was observed using collision-activated dissociation (CAD). The i-Motif formation in the aqueous phase was confirmed using circular dichroism (CD) [38, 39, 40, 41]. Additional stability information comes from UV measurements of the Tm [39, 42]. In addition, the annealing and melting of complexes assessed by MS spectra directly show the short-lived intermediates in the formation tetrastrand i-motifs. Our work demonstrates that ESI-MS can also provide significant structural information of i-motifs. The oligonucleotides (OPC grade) were synthesized by TaKaRa Biotechnology Co., Ltd. (Dalian, China) and used without further purification. The cytosine-rich oligomers are d(CCCC) (Mr = 1094.23), d(CCCCT) and d(TCCCC) (Mr = 1398.28), d(CCCCA) and d(ACCCC) (Mr = 1407.29), d(CCCCG) and d(GCCCC) (Mr = 1423.28), d(TTCCCC) (Mr = 1702.32), and d(AACCCC) (Mr = 1720.35). Stock solutions of the oligomers were prepared by directly dissolving the lyophilized powder in Milli-Q water to approximate 2 mM and were stored at –18°C. The exact concentration of the oligonucleotides was determined spectrophotometrically by measuring the absorbance at 260 nm at elevated temperature (90°C) (http://scitools.idtdna.com/country.aspx) as described earlier . In the default oligonucleotide annealing procedure, 60 to 200 μM DNA in 20 mM ammonium acetate buffer, pH 4.5, was heated to 90°C for 15 min and slowly cooled to room temperature, followed by equilibration at 4°C for 36 h. For CD and UV temperature-curve measurements, the samples were prepared in 50 mM ammonium acetate solution. To obtain a good spray for ESI-MS, immediately prior to ionization, methanol was added at 30% to the annealed DNA . This solution was directly infused into the electrospray source at the rate of 5 μL/min. All experiments were performed on an ESI-Q-TOF mass spectrometer (micrOTOF-Q II, Bruker, Bremen, Germany) in negative ion mode. Optimal soft ionization conditions for the i-motif structures were found using d(G4T4G4) to tune the instrument to produced abundant [(dG4T4G4)2+3NH4 – 8H]5- ions [3, 36], as shown in Figure S1 in Supporting Information. The source conditions were as follows: capillary 3300 V, end plate offset –500 V, dry heater 180°C, and nebulizer pressure 0.4 bar. For MS/MS experiments, parent ions were selected and isolated in the quadrupole and then fragmented in the collision cell. Collision energy: 5–30 eV; in-source collision induced dissociation (ISCID) energy, 50.0 eV. CD spectra were recorded using a J-810 CD spectrometer (JASCO, Tokyo, Japan) using 0.02 cm path length Hellma cell at room temperature. Spectra were recorded from 320 to 230 nm and were the averages of three scans. A baseline corresponding to buffer alone was subtracted from all DNA spectra. The spectra of DNA sequences were obtained using a UV-2550 spectrophotometer (SHIMADZU, Kyoto, Japan) from 200 nm to 320 nm at wavelength steps of 2 nm. Absorbance versus temperature heating and cooling curves was measured at 295 nm and 265 nm, respectively, on the spectrophotometer equipped with a S-1700 temperature controller. Melting and cooling curves were measured at different temperature rates by changing the temperature in ±0.2–1°C steps and leaving the samples to equilibrate for 1 min at each temperature before recording the absorbance. The absorption cell was sealed in order to avoid evaporation, and the gas generated during the heating and cooling process was removed by stirring. Tm values were obtained from the maxima of the first derivatives of the melting profiles using Origin 8 software. All measurements were performed at least three times; the Tm values differed by less than 0.5°C . It should be noted that the melting profiles of interstrand i-motifs mainly reflect the stability of fully intercalated i-DNA tetraplex structures, when the strands were equilibrated with sufficient time . This is why the turning point of melting curves can be considered to be the Tm of such structures. where the numerator is the sum of all strands in tetramers and greater, and the denominator is the sum of all strands in all ions. Each I is the abundance of detected ion in different charge states. When the peaks from monomers and dimers overlap with the tetramer their intensities are subtracted from the tetramer intensities based on the theoretical isotopic profiles. CD spectroscopic measurements and UV melting experiments were performed to confirm whether interstrand i-motifs were formed in solution. As expected, all of the d(XmC4Yn) oligonucleotides in ammonium acetate buffer solution of pH 4.5 gave a broad positive band around 290 nm and a negative band around 265 nm (Figure S2a, Supporting Information). These characteristic CD bands have been demonstrated previously for the formation of either intercalated i-motif structures [38, 39, 40, 41] or non-intercalative C•C+ pair stackings [46, 47]. In contrast, when the pH value was increased to 9.0, the positive band evolved towards around 280 nm, which is a signature of the structural conversion to random coil conformations (Figure S2b, Supporting Information) . In addition, all of oligonucleotides showed an obvious and unaltered turning point in absorbance versus temperature curve of 265 nm (Figure S2d, Supporting Information) and a solid UV melting temperature (Table 1). This further supported the formation of intercalated i-motifs . aEach Tm value is the average of three measurements. To examine the presence of 30% methanol effect on the formation of i-motif structure, CD spectra of the d(TC4) strand were taken in the solution with aqueous ammonium acetate only, with addition of 30% methanol before detection and with addition of 30% methanol and incubation for 36 h, respectively. As shown in Figure S3, Supporting Information, similar CD spectra were obtained, indicating no effect or less effect of the methanol on the formation of the i-motifs in solution. Figure 1a gives representative mass spectra of the sequences d(C4), which shows strong peaks at m/z 546 and 1093, and low peaks at m/z 1367, 1458, and 1641 corresponding to the [d(C4) – 2H]2–, [nd(C4) – nH]n–, [5d(C4) – 4H]4–, [4d(C4) – 3H]3–, and [3d(C4) – 2H]2– ions, respectively (Figure 1a). For simplicity [nM – xH]x– is used to express these multiple ions in the mass spectra (n represents strand numbers and x represents charges). The inset shows the isotopic distributions of the set of peaks. The peak at m/z 1093 suggests three ion species: [M – H]–, [2M – 2H]2–, and [3M – 3H]3- based on the intensity and mass scale spacing between isotopic peaks, which is the reciprocal of its charge state value (1/x). Note that because we do not see peaks at one-quarter spacing, there is no evidence for [4M – 4H]4–. However, the detection of the four-stranded [4M – 3H]3– ion indicates the preservation of the four-stranded i-motif in the gas phase . Higher order complexes are also present as evidenced by the [5M – 4H]4– ion. These are discussed below. The formation of an i-motif has been proposed to involve duplex and triplex intermediates, and the triplex has been presented to be a stable structure with three C-stretches [19, 46]. The detection of [2M – 2H]2– and [3M – 3H]3– ions supports this proposition. Other d(XmC4Yn) sequences studied in this work also form [4M – xH]x– ions. Figure 1b and c show the mass spectra of the sequences d(TC4) and d(C4T), respectively. The mass spectra for the remaining sequences are listed in Figure S4, Supporting Information. The detections of the [4M – xH]x– ions indicate that the i-motif structures formed in solution have been effectively transferred into the gas phase. In the case of d(TC4), the [nM – xH]x– peaks are labeled as [4M – 4H]4– because the peak distribution resembles their theoretical isotopic distribution set, indicating few [3M – 3H]3– or other [nM – nH]n– ions. Many mass spectra provide evidence for species with five and sometimes six strands. While others have shown high-molecular-weight assemblies of C-rich oligonucleotides such as i-wires  and related supramolecular structures , to our knowledge this is the first description of discrete assemblies of five and six strands for small oligonucleotide i-motifs. As explained below, we believe these larger complexes to have an i-motif core. We propose the use of TGFP for multiply stranded ions to quantitatively compare the formation capability of interstrand i-motif by each C-rich polymer. TGFP is defined in the Experimental section above. Comparing the mass spectra of the oligonucleotides d(TC4) (Figure 1b) and d(C4T) (Figure 1c) with the mass spectrum of d(C4) (Figure 1a), both of these produce proportionally more [4M – 4H]4– and [4M – 3H]3– ions than the d(C4) oligonucleotide, with d(C4T) having more [5M – xH]x– and [6M – xH]x– relative to [4M – 4H]4–. d(C4T) also gives more single chain ions as evidenced by the higher intensity of the first and fifth peaks of the [M – H]–/[2M – 2H]2–/[4M – 4H]4– inset in Figure 1c. Previously, NMR indicated that the d(TC4) tetramer was more stable than the d(C4T) tetramer in solution because the 5′ T’s pair and stack to extend the lifetime of C•C+ in solution, whereas the 3′ Ts protrude away from the C•C+ pairs in the d(C4T) tetramer structure . This is consistent with the detection in the gas phase: the tetramer ion of the d(TC4) is more abundant than that of d(C4T). To examine further the effect of non-cytosine bases at the end of d(C4) on the formation of i-motif structures, a series of sequences including d(C4A), d(AC4), d(C4G), d(GC4), d(T2C4), and d(A2C4) were analyzed with ESI-MS. All gave tetramer peaks (Figure S4, Supporting Information). These sequences also showed a tendency to lose an A or a G base from the single strands and complexes, which should occur in solution because of the acid-catalyzed depurination . The TGFP value of each oligonucleotide was calculated and is shown in Figure 2. Peaks for ions that lost an A or a G base were included in the TGFP. A striking difference of TGFP values among d(C4) and its derivative sequences is observed. The sequence d(C4) is less inclined to form tetramolecular i-motif structures among the sequences studied (Figures 1 and 2). This may be attributed to there being only four bases and to the possibility that the “slipped” higher-order structures formed by d(C4) are less stable in the gas phase [18, 49, 52]. Appending one or more non-C bases to the 5′ end gives a greater TGFP than appending to the 3′ end. Regardless of the end to which the non-C base is appended, the bases stabilize the four-stranded structure in the following order: T > A > G.
When two A or two T bases were added at the 5′ end of the d(C4) sequence, abundant –4 and –5 charged tetramers were detected for both sequences. Monomer and bimolecular ions were also seen, but no five-stranded or higher ions were observed. Even though no stoichiometry above four strands was seen, the TGFP values for T2C4 and A2C4 are the highest two observed, comparable to TC4, which has only small amounts of the [5M – 4H]4– ion and essentially no [6M – xH]x–. This indicates that two non-cytosines at the 5′ end of the sequence d(C4) effectively prevent assembly of more than four strands. Measurements of UV-absorbance versus increasing temperature validated the stabilities of the interstrand i-motifs formed by the sequences d(XmC4Yn). Melting of the i-motif is associated with a hyperchromic shift at 265 nm and a hypochromic shift at 295 nm. At both wavelengths, there is a steady decrease in the molar absorptivity for both the i-motif and single-stranded DNA above the Tm [39, 42, 53]. The curves are Z-shaped at 295 nm and sigmoidal at 265 nm. The UV absorbance spectrum of d(TC4) is typical of the DNA sequences studied (Figure S5a, Supporting Information). No significant variation of the Tm was observed with the strand concentrations ranging from 10 to 80 μM (Figure S5b, Supporting Information). Furthermore, cooling curves did not show hyper- or hypochromic shifts; thus these are not equilibrium measurements. Figure S2a and b, Supporting Information, gives the curves of the UV absorbance versus increasing temperatures of the i-motifs of the strands d(XnC4Ym) measured at 295 nm and 265 nm, respectively. The absorbance of each sequence was normalized to 1 at 15°C for comparison of melting behavior. The Tm values calculated at two different wavelengths are the same when both curves have obvious inflection points. All of curves show more or less a single transition. The results for all oligonucleotides are presented in Table 1. d(C4), the shortest sequence, has the lowest Tm. The Tm of [d(TC4)]4 is much higher than [d(AC4)]4 and [d(GC4)]4. All of this is consistent with our mass spectrometry data confirming that a 5′ non-C base stabilizes assembly of these oligonucleotides with T > A > G and two 5′ bases stabilize the complexes even more. When these bases are located at 3′ end, there is similar stabilization with the same non-C bases at 5′ end giving more stability, consistent with the ESI-MS results that a non-cytosine base at 5′ end of the sequence d(C4) prefers to form tetramers. Our data are consistent with the accepted point that ESI-MS results reflect complexes formed by oligonucleotides in solution when the instrumental conditions are carefully controlled [4, 54]. We have shown that the TGFP reflects aqueous stability as indicated by the melting points. We see that the addition of either 5′ or 3′ nucleotides stimulates this percentage. To further investigate the formation of the multistrand i-motif structures, samples of d(TC4) are annealed in different processes. Figure 3b shows that five- and six-stranded structures of d(TC4) could be formed in hours with slow cooling to 4°C, but they were not observed after rapidly cooling and storing at 4°C for the same length of time (Figure 3a). This indicates that multistrand i-motifs are generated in solution rather than in the ESI process. In addition, upon CID, the [5M – 4H]4– separated to produce [M – H]– and [4M – 3H]3–, and the [6M – 5H]5– separated to form [M – 2H]2–, [M – H]–, [5M – 4H]4–, [4M – 3H]3–, and [5M – 3H]3– (the insets in Figure 3b), indicating a strand by strand dissociation process. We believe the complexes with stoichiometries greater than four are “slipped” structures as shown in Scheme 2c and d. These begin with tetramers comprised of paired parallel strands that are incompletely intercalated as shown in Scheme 1c. Terminal non-C bases keep the parallel strands in register because non-C•C pairs are disfavored, whereas non-C•non-C pairs can form [13, 23, 24]. For five-stranded structures, an additional strand will abut onto the inside end of one of the strands, perhaps hemi-intercalating into the adjacent antiparallel C•CH+ pairs, as depicted in Scheme 2a and e. For six-stranded structures, the sixth strand lies parallel and opposite the fifth strand (Scheme 2b, f). We cannot know from these studies if the terminal non-bases intercalate and pair, or simply protrude. The proposed structures are consistent with the peak distribution: five-stranded structures are much less frequent than four-stranded ones. Six-stranded structures are of the same order of magnitude in intensity as five-stranded structures. Addition of a seventh strand would produce another drop off, and is not seen. One might expect that d(C4) would have the biggest capability to form higher order structures through interlocking or slipped strand interactions; however, only small amounts were seen by ESI-MS. This could be due to a particular gas phase instability of slipped structures for tetranucleotides or a reflection of the actual assemblies in solution. d(C4) does not have non-C bases to keep parallel strands in register. Many of these out of register structures may be unstable to the soft ionization conditions. Our results show that the interstrand i-motifs formed in solution are transferred from the solution into the gas phase. Varieties of interstrand associations including singly, doubly, and triply stranded ions have been observed with ESI-MS (Figure 1). To investigate the association process of the interstrand i-motifs in solution, the strand d(T2C4) was annealed in ammonium acetate buffer, pH 4.5, by heating to 90°C for 15 min and slowly cooling to 4°C at the rate of –1°C/min; then the samples were stored at 4°C for extended incubation. Aliquots were taken at indicated times and subjected to ESI-MS analysis. As shown in Figure S6, Supporting Information, and Figure 4a, the abundances of the four-stranded [4M – xH]x– ions increase with cooling time. The singly, doubly, and triply stranded ions appeared in the mass spectrum of the samples immediately after they were heated to 90°C for 15 min (Figure S6a, Supporting Information). Some [4M – xH]x– ions can be detected at the start of the 4°C incubation phase (Figure S6b, Supporting Information), indicating that interstrand association can be fast. Some dimer and trimer ions persisted with the tetramers throughout the annealing process, suggesting a strand-by-strand association pathway of the i-motif. This is consistent with Leroy’s assembly scheme  and further supports that the distribution of strands in the gas-phase analysis reflects the aqueous phase distribution at the time of ionization. Dissociation was tested by slowly heating a fully annealed d(T2C4) tetrastrand i-motif from 35 to 60°C in ammonium acetate buffer, pH 4.5. ESI-MS analysis revealed that abundances of the tetrastrand ions greatly decreased with the increase of solution temperature, and the duplex and triplex intermediates appeared concurrently as shown in Figure S7, Supporting Information and Figure 4b. Gas-phase dissociation of the four-stranded i-motif ions was also investigated. The d(T2C4) [4M – 5H]5– ion (m/z 1361.27) was selected as the precursor ion for CAD in a collision cell. Figure S8, Supporting Information, shows product-ion spectra of the [4M – 5H]5– obtained at collision energies of 5, 10, 15, and 25 eV, respectively. Figure 5 shows the percentage of each ion in the product-ion spectra of the [4M – 5H]5– ion varying with collision energies. It was noteworthy that the trimer [3M – 3H]3– had a longer lifetime and higher intensity than dimer [2M – 3H]3– during the gas-phase dissociation process. Thus, we demonstrated a strand-by-strand stepwise dissociation process of i-motif tetramer in the gas phase, with the triply to doubly strand transition being slow. Such gas-phase dissociation behavior was also observed for the G-quadruplexes [33, 55]. Finally, the kinetics of association and dissociation of the interstrand i-motif in solution was studied by analyzing UV absorbance in heating and cooling curves. We found that some i-motifs would refold at least partially when the temperature gradually decreased after the complex was heated to 90°C. This can be compared with refolding of the tetramolecular G-quadruplex, which is more temperature- and DNA concentration-dependent . However, the inflection determined in melting curves (Tm) of i-motif tetramers changed to a lower temperature or even disappeared in the cooling curves (Figure 6 and Figure S9, Supporting Information). This indicated that the dissociation rate of tetra-stranded i-motifs is faster than the reassociation rate in these processes. Figure 6 also shows that the hysteretic phenomenon of the cooling curves at 265 nm is lessened with a shallower thermal gradient. It is most likely that the tetramolecular i-motif structure could not be formed completely in the given time because of the complexity of bringing together four strands and the number of nonproductive, out of register initiations that are possible . There is sufficient time to form intermediates (predominantly dimers) or partially intercalated species, which are also associated with absorbance changes. This is consistent with the need to give samples up to 36 h to come to equilibrium when annealing i-motifs from denatured oligonucleotides, and the need to follow the association of TC4 oligonucleotides for weeks at 0°C by NMR . It can be concluded that the formation of tetramolecular i-motifs and G-quadruplexes follow different kinetic processes. The G-quadruplex may have a more stable structure when an appropriate cation is present for insertion between the G-tetrads [56, 57, 58]. For some sequences, the tetramolecular i-motif can be partly aggregated in a few hours after denaturation and slow cooling. This raises the intriguing possibility that the cells may have enzymes that catalyze i-motif folding when it is needed. We are following up on this in our continuing studies on the comparisons of the association mechanism of these two structures. A fragment of the C-rich strand of telomeres (vertebrates and tetrahymena) containing four adjacent cytosines has been reported to form an i-motif by intramolecular folding at neutral pH [38, 59]. This suggests that i-motifs are involved in some functional biological complexes. We chose a tract containing four 2'-deoxycytidines and explored a new methodology to study the tetramer stability. I-motif structures are preserved by negative electrospray ionization. Rosu et al. demonstrated this through a combined ion mobility spectrometry and IR spectroscopy experimental approach . In this work, we used ESI-MS-produced zwitterionic i-motifs and demonstrated their occurrence and stability in the gas phase using mass spectrometry. The CD spectroscopy results revealed i-motif structure in solution and the values of Tm were found through UV melting curves. Here, we report the different i-motif-promoting effect of A, T, G, AA, and TT on the 5′ or 3′ terminus of d(C4). Residues added to the 5′ end stabilize the tetramer and are more effective than those added to the 3′ end. On the 5′ end, the promoting effect is favored by T > A > G, both in the gas and solution phase. However, the 3′ end promoting effect of non-cytosine bases is not quite the same in the gas and the solution phase. We observed high-ordered structures for d(C4) in our mass spectra, and our UV melting curve confirmed the instability of the d(C4) supramolecular complexes. In addition, we have shown that the Tm of i-motif is independent of DNA concentrations because of the non-equilibrium melting profiles . Interestingly, we see different dissociation behaviors of the i-motif in the gas phase and solution that may help us to establish the relationship between two phases and further study the real properties of i-motifs.